Here at Salon D’Artiste, our goal is to ensure the complete satisfaction of every guest, while offering knowledgeable and friendly service at competitive rates. Our mobile app now promises to deliver this same level of service and satisfaction from your very own mobile device! It’s free, easy to use, and just like having your own miniature front desk right in the palm of your hand. 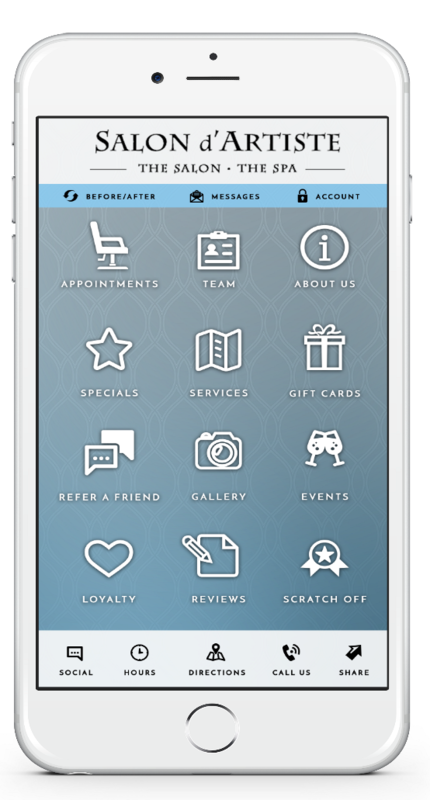 With our app, you can find the perfect day and time for your appointment, and instantly schedule it yourself- no calling and no waiting! You’ll receive your appointment confirmation right through the app, and you’ll be able to follow up to check on your appointment details as well. You can also use the app to keep up with our current specials, browse our full menu of products and services, get in touch with us directly, read our salon reviews, learn about our professional stylists and even access our blog! And, if you need even more reasons to love our app, how about doing your shopping in your jammies!. Purchase a gift card for any occasion and give them the gift of Salon D’Artiste. Gift cards can be used for products and services, and we’ll even send it directly to the recipient. Get directions to the salon wherever you happen to be at the moment and enjoy many other benefits from our free mobile app. You can find us at Eagle Village Shops at 205 Lancaster Ave. #2 in Wayne, or call us on 610.687.2020. At Salon D’Artiste, we’ll help you get ahead of the curve with our cutting-edge services and our free mobile app. If you’re ready to download it and see for yourself, find it today on iTunes, Amazon, or Google Play.